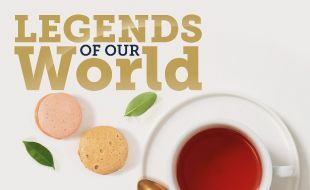 If you are 45 years or older, Legends of our World is tailor made for you! For just R50 you can buy a voucher booklet at the Cash Desk and enjoy great rewards including High Tea at Billy G.
Draws will take place on the last Thursday of every month where you stand a chance to win your share of R5,000 in cash! No persons under the age of 18 may participate in this tournament. Any person who has been refused entry to the casino or who is self-excluded, prior to or during the tournament, may not participate and will be disqualified. Promotion is only open to participants that are 45 years of age and over. Vouchers strictly limited to one per person and are not transferable. Vouchers will not be replaced or refunded in the event of them being damaged, stolen or lost. FreePlay Vouchers are valid for 14 days from date of issue. High Tea voucher will only be valid for the draw date. All draws are attendance draws and no late entries shall be accepted. Participants are required to sign-up to the Goldfields Rewards Program in order to redeem the R50 FreePlay voucher. The Master of Ceremony will announce the start of festivities Guests who are not present at draws will forfeit their prize and a redraw will be done. It is the patron's responsibility to ensure that they are present for their respective draws. In the event of technical failure or damage to the device used for the promotional draw, irrespective of the cause, another suitable device or method will be used, at the sole discretion of Management or the draw may be postponed. Any Complaints and/or dispute can be lodged to the FSGLTA. Copies of these rules are available at the Customer Service Desk, the Privé Ambassadors Desk upon request.